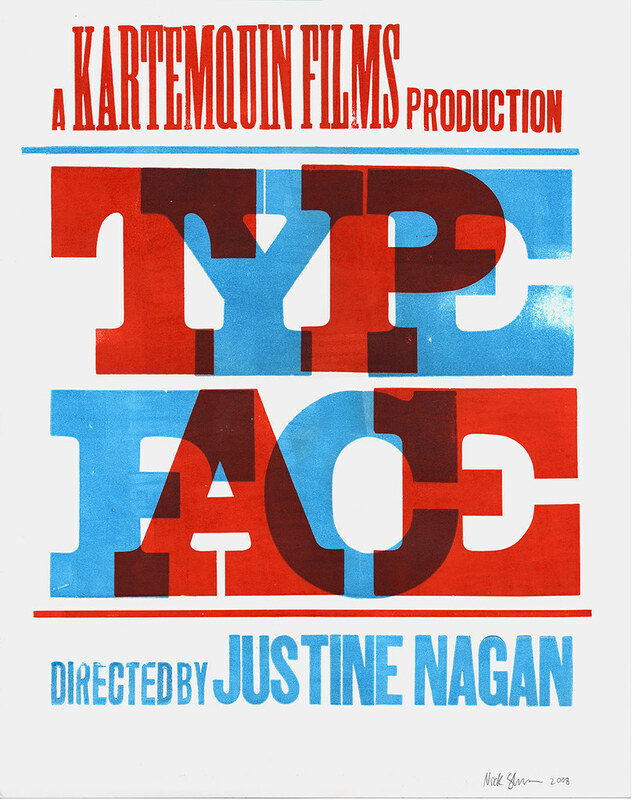 15″ × 19″ posters printed by Nick Sherman to promote the documentary, "Typeface"
Director Justine Nagan is now putting the finishing touches on Typeface , a feature-length documentary film about the Hamilton Wood Type & Printing Museum. The film is a production of Chicago-based Kartemquin FIlms (of Hoop Dreams fame). I designed and printed a poster last year (pictured above) to promote the film and help raise money for the production; I’ve also done some advising on rough edits of the film. Justine and the team working on the documentary are dedicated and skilled filmmakers (not to mention great all-around people), and the edits I’ve seen so far are very promising. After having spent much time at Hamilton, I anxiously look forward to a broader public release to help spread the word about the museum. To get info about when and where to see the film (including a screening next week in Atlanta! ), buy limited-edition posters, read news updates and info on the project, and more, see the official Typeface site. One comment on “Typeface” documentary on Hamilton Wood Type & Printing Museum .